What goes well with cycling? Many things, with food and drink being high on the list. Del’s Frozen Lemonade is everywhere here and now: here being Rhode Island, now being summer. Tomorrow, being Labor Day, will mark the end of summer for many people and businesses. I expect to see fewer Del’s trucks and carts on my travels, starting September 5. But there is the Del’s storefront in Warren. I stopped there to get a lemonade on my ride yesterday. I rode from Barrington down to the the south end of the East Bay Bike Path, which is in Bristol. On the way down I passed the Del’s store and a Del’s cart next to the path as it goes through Colt State Park. On the way back I rode right past the cart again, but didn’t ride right past the store! The frozen lemonade was very welcome and tasty. Most of it replaced the water in my bottle, so that it could be sampled by family when I got home. Strava, which I’m now using to keep track of my rides, tells me that it was a 12.8 mile round trip. That’s my bike, bottle and backpack in the foreground of the photo, by the way. 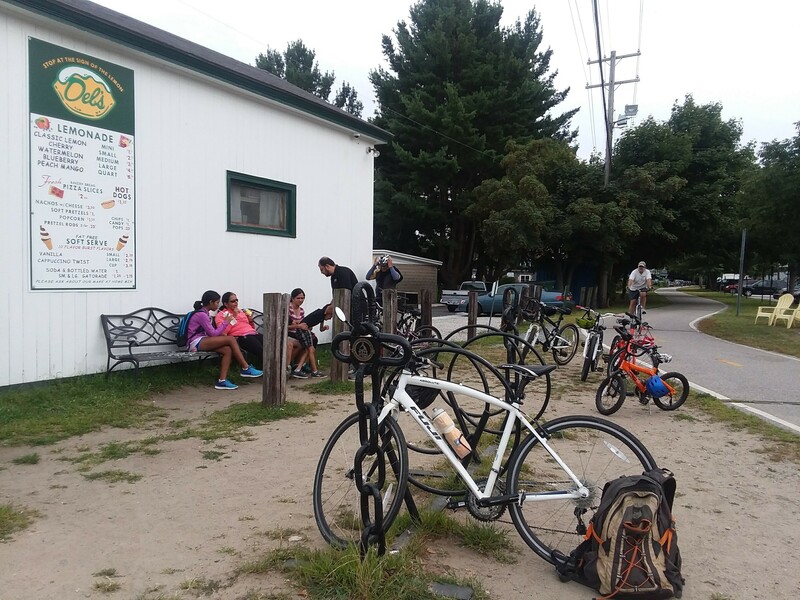 The bike path is justly popular, not just because of the scenery, but because of the food and drink along the way. Yesterday at The Daily Scoop in Barrington, a cyclist at the next table was extolling this very virtue of the path. Thanks for reading. I hope that you are also enjoying exercise, food, and drink, If you’re local, I might see you on the bike path, and would appreciate comments recommending refreshing stops along the way. Welcome to Rhode Island! Perhaps we’ll meet along a bike path; or, somewhere else ’round Little Rhody. Next Next post: Engagement: Employees, etc.